History: Bear with me on this one, for my history on the Anvil is rather thin at this time. My first notes on the Anvil come from Calgary Stampede Wrestling, where Neidhart first came into contact with many of his future brothers-in-law. Neidhart and Hercules Ayala became a team, and won the International Tag-Team Titles in 1980 from Kasavudu & Mr. Sakurada. They later lost the belts to Duke Myers & Bobby Bass. Neidhart continued to train himself in Canada's top wrestling organization for the next few years. In March '83, Neidhart made it back to the top of the International Tag-Team ladder, teaming with Mr. Hito and getting the belts from Myers & Kerry Brown. They kept the titles for 6 months before dropping them to Francisco Flores & the Cuban Assassin. Neidhart was later inducted to the official Stampede Wrestling Hall of Fame. 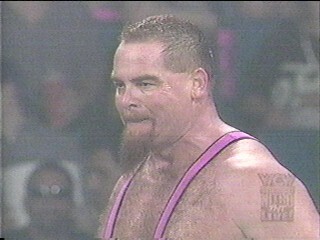 Neidhart next wrestled some in Louisiana & Oklahoma, before heading over to the NWA Mid-South, building a reputation for himself in the United States. Neidhart teamed with Butch Reed to win the NWA Mid-South Tag-Team belts from Magnum T.A. and Jim Duggan ("Hacksaw"). The lost the belts two months later to Magnum T.A. and Mr. Wrestling II. Neidhart next went down into Florida, where he wrestled for various NWA organizations. In August '84, Neidhart defeated Angelo Mosca to win the NWA Southern Heavyweight Championship. He lost it less than a month later to Pez Whatley. Neidhart later teamed with Krusher Khrushchev (Barry Darsow) to gain the NWA US Tag-Team Titles, beating Hector Guerrero and Cocoa Samoa (subbing for Chavo Guerrero). The Youngbloods defeated them for the belts at the beginning of '85. 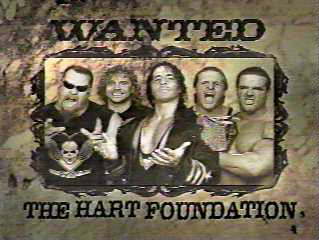 Soon after, Neidhart came to the WWF, teaming with Bret "The Hitman" Hart (his brother-in-law) to form the Hart Foundation, with Jimmy "Mouth of the South" Hart as their manager. The Hart Foundation first won gold in January '87, defeating the British Bulldogs (Davey Boy Smith and the Dynamite Kid, who are also brother-in-laws to Neidhart). They later lost the belts to Strike Force (neither of whom are related to Neidhart). Neidhart and Hart came back in August 1990 to beat Demolition for their 2nd title reign, which lasted almost 7 months before losing to the Nasty Boys. Soon after, the two separated, when Bret wanted to try out his singles career. 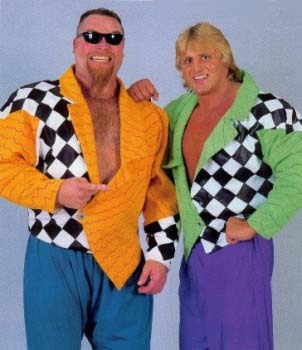 "The Anvil" vanished from the WWF for a while, wrestling briefly in the ECW, then reappeared as Owen Hart's partner on the New Foundation, a tag-team that did not go far. Neidhart later joined with Bret, his brother Owen, and Davey Boy to reform the Hart Foundation, which began to terrorize the WWF. But, after Bret Hart left the organization after major problems with Vince McMahon, Neidhart took off. In 1996, Neidhart appeared some in Northeast Wrestling, where he battled against Bam-Bam Bigelow in a match for the N.E.W. Heavyweight Title. Bigelow won the match. Neidhart and Davey Boy (British Bulldog) then followed Hart to WCW. Neidhart wrestled with the Bulldog as a good tag-team, and had feuds with Steve McMichael, Curt Hennig, Brian Adams, Rick Rude, and other members of the nWo. However, WCW was not happy with his skills, and when the British Bulldog was injured, subsequently released him. Neidhart has been through several organizations since leaving WCW, and has won titles in the International Championship Wrestling Association (Florida), the Mid-Eastern Wrestling Federation (Maryland), and in Memphis Championship Wrestling (Tennessee). He appeared on a few independent wrestling cards, including in the ECW. In 2000, he was a major star in the MCW, having a very long feud with the Blue Meanie. He also battled against the KAW Crew, Jerry "The King" Lawler, Bill Dundee, Bitty Little, and others. He departed the MCW in the summer of '00. Neidhart has continued to wrestle in the independent circuit, though, and finished off a tour in the UK in 2001, fighting in Hammerlock Wrestling. - GCW Omni Thanksgiving Tag-Team Tournament '83 = Neidhart & King Kong Bundy defeated Joe Lightfoot & Tommy Rogers, then lost to Butch Reed & Pez Whatley, who eventually won the tournament. - Mid-South Television Title Tournament (April '84) = Neidhart lost in the first round to Butch Reed. Krusher Khruschev won the tournament. - WWF Wrestlemania II ('86) = Neidhart wrestled in a "Battle Royal", which was won by Andre the Giant. - WWF Saturday Night's Main Event #8 (November '86) = The Hart Foundation (Neidhart and Bret Hart) lost to the Killer Bees. - WWF Saturday Night's Main Event #10 (February '87) = The Hart Foundation stayed the WWF Tag Champs by beating Tito Santana and Dan Spivey. - WWF Wrestlemania III ('87) = The Hart Foundation and Danny Davis won over the British Bulldogs and Tito Santana. - WWF Saturday Night's Main Event #11 (April '87) = The Hart Foundation lost a "3 Falls" Match to the British Bulldogs, but, due to one of the falls being a disqualification, retained the WWF Tag belts. - WWF Saturday Night's Main Event #12 (September '87) = The Hart Foundation defended the WWF Tag Belts by beating the Young Stallions. - WWF Survivor Series '87 = The Hart Foundation, Demolition, the Islanders, the Russians and Greg "The Hammer" Valentine and Dino Bravo fought in a "Tag-Team Elimination" Match against the British Bulldogs, Strike Force, the Young Stallions, the Rougeau Brothers and the Killer Bees. Neidhart and Hart were eliminated when Hart was pinned by "B" Brian Brunzell. The Young Stallions and the Killer Bees were the "survivors". - WWF Royal Rumble '88 = Neidhart competed in the "Royal Rumble", which was won by "Hacksaw" Jim Duggan. - WWF Main Event I (February '88) = The Hart Foundation lost to then-WWF Tag Champs Strike Force. - WWF Wrestlemania VI ('88) = Neidhart wrestled in a "Battle Royal", which was won by Bad News Brown. - WWF Wrestlefest '88 = Neidhart defeated Larry Poffo. - WWF Summerslam '88 = The Hart Foundation lost to then-WWF Tag Champs Demolition. - WWF Saturday Night's Main Event #17 (October '88) = The Hart Foundation again lost to Demolition, who stayed the WWF Tag Champs. - WWF Survivor Series '88 = The Hart Foundation, the Powers of Pain, the Rockers, the British Bulldogs and the Young Stallions fought in a "Tag-Team Elimination" Match against Demolition, the Fabulous Rougeau Brothers, the Bolsheviks, the Brain Busters, and the Conquistadors. Neidhart and Hart were eliminated when Hart was pinned by Terry Blanchard. The Powers of Pain were the "survivors". - WWF Royal Rumble '89 = The Hart Foundation and "Hacksaw" Jim Duggan won a "3 Falls" Match over Dino Bravo and the Quebecers. - WWF Wrestlemania V ('89) = The Hart Foundation defeated Rhythm and Blues. - WWF Saturday Night's Main Event #21 (April '89) = Neidhart was defeated by the "Macho King" Randy Savage. - WWF Summerslam '89 The Hart Foundation lost to the Brain Busters. - WWF King of the Ring Tournament (October 14, '89) = Neidhart fought to a Double Disqualification with Hercules. Tito Santana won the tournament. - WWF Survivor Series '89 = Neidhart, the Ultimate Warrior and the Rockers fought in an "Elimination" Match against Haku, Andre the Giant, Arn Anderson and Bobby "The Brain" Heenan. Neidhart was eliminated by Haku. The Warrior was the "survivor". - WWF Royal Rumble '90 = Neidhart competed in the "Royal Rumble", which was won by Hulk Hogan. - WWF Wrestlemania VI ('90) = The Hart Foundation easily defeated Nikolia Volkoff and Boris Zuhkov. - WWF Saturday Night's Main Event #26 (April '90) = The Hart Foundation and the Rockers fought to a Double Disqualification. 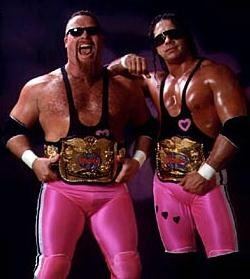 - WWF Summerslam '90 = The Hart Foundation won "2 Out of 3 Falls" over Demolition to win the WWF Tag-Team Titles. - WWF Survivor Series '90 = The Hart Foundation, Dusty Rhodes and Koko B. Ware fought in an "Elimination" Match against Ted DiBiase, the Undertaker and Rhythm & Blues. Neidhart was eliminated by DiBiase, who was the sole "survivor". - WWF Royal Rumble '91 = Neidhart was involved in the "Royal Rumble", which was won by Hulk Hogan. - WWF Wrestlemania VII ('91) = The Hart Foundation lost the WWF Tag Titles to the Nasty Boys. - SWS Wrestlefest (March '91) = The Hart Foundation defeated the Rockers. - WWF Royal Rumble '92 = Neidhart and Owen Hart defeated The Orient Express. - NJPW Sumo Hall (August 10, '92) = Neidhart & the Barbarian were beaten by Tony Halme & Bam-Bam Bigelow. - NJPW Sumo Hall (August 12, '92) = Neidhart, Barry Windham & the Barbarian lost to Tony Halme, Bam-Bam Bigelow & Scott Norton. - WCW Clash of the Champions XXIII (June '93) = Neidhart defeated Shanghai Pierce in a dark match. - NJPW G1 Climax '92 (August 6-12, '92) = Neidhart lost in the first round to Kensuke Sasaki. - NJPW Super Grade Tag League II (October 8-21, '92) = Neidhart and Tom Zenk competed in the League, which was won by Riki Choshu and Shinya Hashimoto. - ECW November To Remember I ('93) = Neidhart and the Sandman fought to a Double Disqualification. - WWF Jacques Rougeau Retirement Show (October '94) = Neidhart was beaten by then-WWF World Champ Bret "Hitman" Hart. - WWF Survivor Series '94 = Neidhart, Owen Hart, Shawn Michaels, Diesel, and Jeff Jarrett fought in an "Elimination" Match against Razor Ramon, the British Bulldog, the 1-2-3 Kid and the Headshrinkers. Neidhart was counted out. Ramon was the "survivor". - World Wrestling Peace Festival '96 (June '96) = Neidhart defeated Bobby Bradley, Jr.
- WWF King of the Ring '97 = Neidhart, Owen Hart and the British Bulldog defeated Psycho Sid and the Legion of Doom. - WWF In Your House 16 (July '97) = Neidhart, Bret Hart, Owen Hart, Brian Pillman and the British Bulldog defeated "Stone Cold" Steve Austin, Goldust, Ken Shamrock and the Legion of Doom. - WWF Survivor Series '97 = Neidhart, the British Bulldog, Phil Lafon and Doug Furnas fought in an "Elimination" Match against Vader, Mark Mero, Steve Blackman and Goldust. Neidhart was eliminated by Vader. The Bulldog was the "survivor". - WCW Fall Brawl '98 = Neidhart and the British Bulldog defeated the Dancing Fools. - Heroes of Wrestling (October '99) = Neidhart & King Kong Bundy beat Jake Roberts & Yokozuna. - ACW St. John Show (May 7, '02) = Neidhart won over Vinnie. - ACW Berwick Show (May 11, '02) = Neidhart & Bobby Rude defeated Jason Bates & the Kingpin. - BCW Toronto Show (January 16, '03) = Neidhart & A-1 lost to Jim Duggan & El Fuego. - NEPW Norwalk Show (January 18, '03) = Neidhart & Da Manchis took down Southern Anarchy & J-Rocc. - IWC Night of Legends 3 (March 24, '07) = Neidhart defeated Salvatore Sincere.